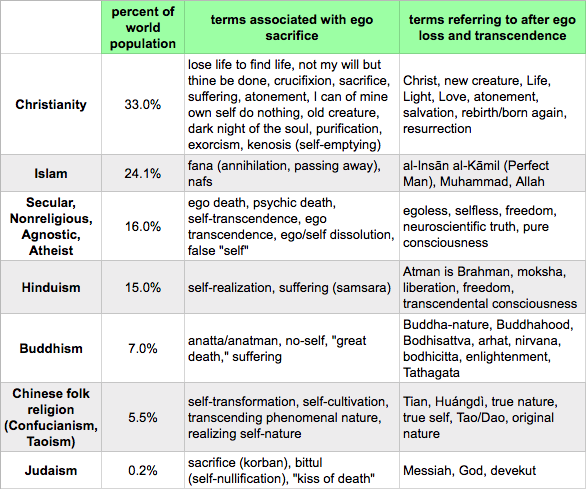 We see this theme repeated over and over again throughout religious history into the present day, from Judaism through Christianity, in Hinduism and Buddhism, in Islam, in Confucianism and Taoism, and even into modern day scientific studies, that the overcoming of “self” or ego is central to our flourishing in an abundance of Life and Love in the world, and in realizing higher Truths that go far beyond our typical everyday minds and consciousness. I don’t think this is a mere coincidence, or that there is no correlation between all of these systems of belief on this theme which seems so central to all of them. There is something fundamental underlying all of these systems that is telling us that the human ego, or sense of “self,” in our consciousness is problematic, and that when it falls away there is a release, a freedom, an exaltation, a realization of a higher reality, a more holistic reality, where consciousness perceives things as One Great Whole, and this is radically transformative to human lives. Mystics, saints, sages, gurus, prophets, teachers, guides, shamans, and now scientists seem to all be saying a very similar message, using a multitude of different symbols. From our rational state of consciousness, we often think the different symbols and metaphors must be referring to different things. We think that a “Buddha” can’t possibly mean the same thing as a “Christ.” But I think the reality is that they may be very much a reflection of the same human condition and experience, just referred to in many different ways, from many different cultural points of view. The way out of these debilitating and harmful “fallen” conditions is by sacrificing that “self,” transcending it, seeing it for what it is, realizing that it is a construction in our consciousness, that this self-centered point of view is not substantial, fundamental, or immortal. It is a story that we tell ourselves, that the ego tells itself. Having a “center” to our consciousness helps us to navigate the world, but this ego consciousness in humanity often far overgrows its usefulness, and actually becomes quite damaging to human life and prosperity. It is the exact opposite of the kind of Ayn Rand self-centered egoism that is found in many areas of the world today, that only wants to make one’s self happy at the expense of all else and all others. When we lose consciousness of our localized embodied “self,” we discover that we are part of a much greater system, a grander enterprise, a unified scope, a deeply interconnected process of life and being that is one and the same with Reality itself. We come to realize there is nothing truly separate, apart, or isolated from this Whole. Everything and everyone belongs, and we don’t distinguish between “I” and “them,” or “self” and “other.” There is no “I” or “self,” and so we identify with all that we experience, all that we perceive. This is oneness, atonement, nonduality, singularity, omega point, unity, entanglement, whatever we want to call it. And this perspective radically changes our worldview and approach to life. We come to know that we are not this individual “self,” but we are Life, a dynamic emergent creative process of the Cosmos itself. Some religions call this Incarnation. We are the Cosmos becoming conscious of itself, the Cosmos/Divine/God/Nature knowing itself. We lose our egoic “self” in order to “save” our Self, our collective Self, as we realize that we are One with all Beings in Life, that we are that Life that is manifest in a multiplicity of diverse forms throughout the world, and we work together as One for our common good. This is pure Love. I wonder what would happen if we could realize that the world’s religions and science are not seeking entirely different things after all, but at their roots are seeking something very similar, just referred to by different names and described with different metaphors and symbols. What if we could realize that we are all human beings, with a similar human condition and conscious experiences, and that our deepest yearnings in life may be one and the same. How could this change the world?